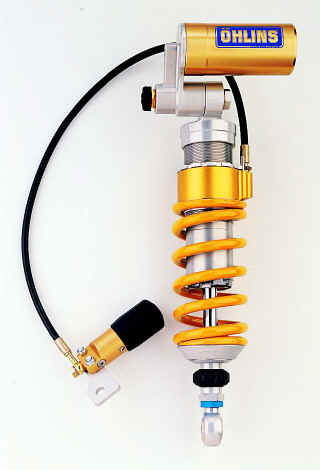 Update 22.Nov: last summer I rode a simple modified RC30 Öhlins-shock-i used a 66kg/cm Spring instead of the std. RC30 170kg/cm.The shock and my Fuel tank are moreless part of ONE concept,and because both Items are related by space they need and I didn't know the result in the End,so I used the cable (Piggybag) Shock of a RC30. Yet all is different:I re-shaped the Fueltank for stock capacity (got the capacity at the bottom) - prepared the Fueltank for a std.available RC51-Öhlins-Shock .This Öhlins-shock needs only a slight modification : the angle of the gas-Can is (just to say sth.) about 20° more directed against Swingarm. And: if you lose a total of 100 Pounds at this Bike,the std.80 kg/cm spring probably wont work,so i decided to use a spring around 72 kg/cm . Ha-it's mentioned in my scattered weight decrease-section-you lose 600 gr vs.stock with an Öhlins! -1.32 lbs .It's no saying - 600gr are worth 600DM (only the weight lose),so if you deduct the weight saving in DM or $,the shock is real cheap.But attention-use a Öhlins WITHOUT hydraulic spring-preload.